Say you love Llamasauarus, and Llamasaurus hears you. I just got a comment from, I assume, Barry Walker, lead singer of that band and currently with the Nashville-based group Iron Hee-Haw. Please check their site--the tracks available for download in the "Songs" section are excellent, with the same plaintive, slightly twangy vocal approach and distorted guitars that made me like him in the first place. 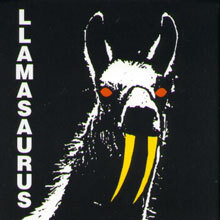 Llamasaurus was pretty big with a number of us at the college station way back when, on the strength of tunes like "Remember Me" and "You Don't Love Me Anymore". It's cool to see the guy producing such good songs all these years later. Now all I need are emails from Nikki Parasite, the Groove Diggers and the Immaculate Hearts. That is awesome. I still love the cover of that album. Jeff still brings Llamasaurus up every once in a while (partly because he had that whole weird llama bet thing going on, but still). Viva Llamasaurus. LLAMA RULES!! I'm listening to them now! Oh, gawd, we must have listened to them about a zillion times at WKU. Mostly because of the cover.